Tipped off by her grandfather about an ancient land full of dinosaurs, Sarah Maribu sets off on a wild adventure. Upon arrival, her husband, Michael, goes missing and must be saved! Track down the dinosaur-worshipping natives and get Michael back! 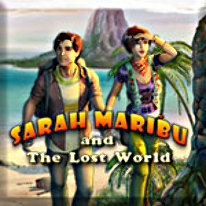 Collect incredible treasures and explore a mysterious island full of puzzles and hidden objects in Sarah Maribu and the Lost World.